THE Family and Morale, Welfare and Recreation Command recently developed and produced an iPhone application, bringing its resources to customers and employees on a mobile platform. The “Mobile MWR” app, which will be updated progressively, provides consolidated access to a variety of resources available though www.armymwr.com. Users can also browse news updates, social media sites and videos from the command. “It’s impossible to know exactly where the future is headed, but what we do know is that more and more people are turning from desktop computers to mobile communication devices,” said Ed Johnson, director of FMWRC Public Affairs. “It’s important to note that this is not just developed for MWR customers,” Johnson continued. 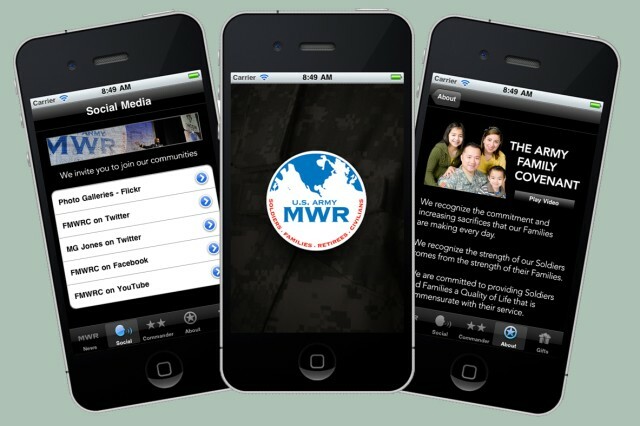 “We included resources for both customers and employees; if you’re affiliated with Army MWR in any way, this app may be of use to you. “In the past, people would use the Internet to get information, now they expect more. They want to share it and they want to access it on the go,” Johnson said.